Sinking your teeth into a perfectly ripened ear of sweet corn straight from the stalk is one of the finest pleasures of summer. I long for that moment all winter long. But a girl can only eat so many ears of raw corn, so it’s nice to branch out. 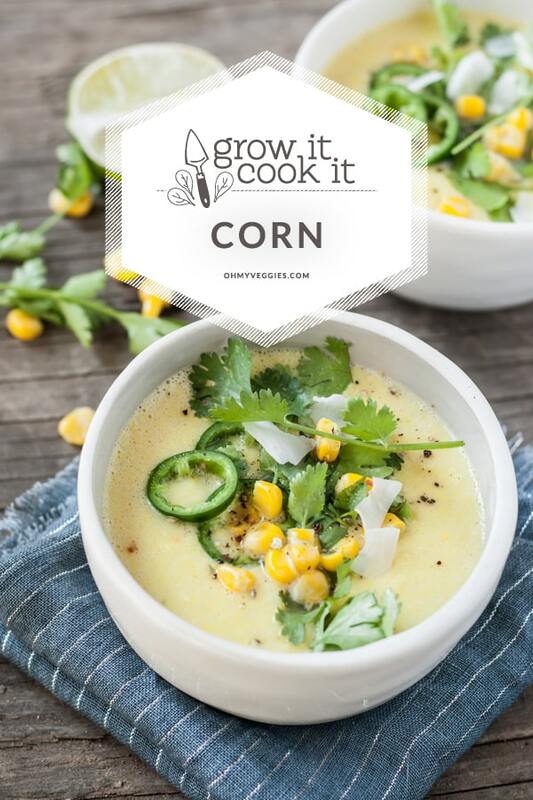 With the chillier weather we’ve had here recently, this vegan corn chowder recipe has become a new favorite way to eat this summertime treat. If you are interested in growing corn in your garden, I highly recommend it—if you have the space. Unfortunately, if your garden is on the small side, it may be a little tricky as corn needs plenty of room to grow. Since corn is primarily pollinated by wind, you will want to make sure to plant corn in blocks of short rows rather than in a single long row. Corn appreciates full sun and fertile, well-drained soil. To keep your harvest coming, make sure to plant a few successions of corn throughout the season. Now that the days are getting shorter and the arrival of fall isn’t far away, I find myself craving heartier meals that are still packed with summer flavors. Enter this Sweet Corn and Coconut Milk Chowder. This soup has everything going for it. It’s sweet, spicy and creamy, and packed with farm-fresh flavors—summer “comfort” food at its best. The garnishes are definitely a must, so please don’t skimp on them! If you’re in need of a new soup to add to your recipe book, this should be at the top of your list. Pour a glass of your favorite wine, invite a few friends over for dinner and dig into this lovely chowder. Cheers! Farm-fresh corn, creamy coconut milk, and a good hit of jalapeño peppers come together for the quintessential summertime comfort food. Add the coconut oil to a large stock pot over medium-high heat. Once the oil is hot, add the onion and sauté until lightly browned and tender, about 5 minutes. Add the garlic, fresh jalapeños, and corn. Cook, stirring often, until the vegetables are tender, about 5 minutes. Stir in coconut milk and water. Bring to a boil. Reduce heat and simmer until the vegetables are soft and the soup is fragrant, about 15-20 minutes. Add salt and pepper to taste. Use an immersion blender or, working in batches, carefully transfer the soup to a high-speed blender and puree until smooth. Return the soup to the pot. Stir in the lime zest and juice. Taste and add additional salt and pepper if desired. Ladle the soup into individual bowls and garnish with plenty of minced cilantro, pickled jalapeños, corn kernels, and coconut flakes. Just made this for the second time. Followed the recipe the first time using water. This time used vegetable broth. Delicious. I loved this soup. I didn’t add the garnish though. Instead, I only partially blended the soup so it was still a little chunky.